As you know on Friday, the Health Committee voted unanimously to pass LD 1076, which would, in its current form, add the Vaccine Injury Compensation Program to the Maine DHHS web site. Today I was on the Vax Maine Kids fb page and noted that they mentioned the vote . Then Shawn Box noted that it had already been added to the web site, commenting, “Hows that for responsiveness?” So I went to the page in question and could not find the link, even when I searched the page for the word “injury.” After spending a few minutes searching the entire site, I found that the only place the phrase, “Vaccine Injury Compensation Program” existed on the site was in the “News” section that reported on the Bruesewitz ruling in Feb of 2011 in a link entitled U.S. Supreme Court Upholds Vaccine Injury Compensation Program which goes to a dead page on the AAP web site. So I read the page that Mr. Box linked in its entirety, and found that there was a link to something called the, “National Vaccine Compensation Program.” I had swept right past this, as it sounded as if it was federal program to pay for vaccines, and because the word “injury” was conspicuously missing from it. So I clicked on it to find that yes… this apparently is supposed to be the link that fulfilled the requirements that LD 1076 would set, but is intentionally mislabeled so that the word “injury” does not appear. In all the years I have been writing and researching on the VICP, I have never even heard it referred to as the “National Vaccine Compensation Program.” Image attached. As you might imagine, I assumed that this was a bad faith move on the part of DHHS to technically fulfill the requirement proposed by LD 1076 with out actually letting the public know that there is a vaccine INJURY program. However, in preparation to write to you to file a complaint, I checked the way back machine and found that this was not done in response to LD 1076, but that this link had been added to the site in December of 2012, following the Oversight and Government Reform hearings on vaccines and autism. 1. Why is the VICP link mislabeled? 2. Why is the VICP link under “Links of Interest” and neither the “information for providers” nor the “information for parents” where both parents and providers would be looking for the information? Further, I was disturbed to see that you have a link to the Autism Science Foundation on the site, as it is an private vaccine industry promotional group. You also have several other such groups that you are officially blessing by having them on the site. We respectfully request that you either remove these private groups from your web site, or that you add the Maine Coalition for Vaccine Choice as a resource for parents, as we are the only vaccine program watchdog in the state of Maine, and you do not link to any groups that are not solely vaccine promotional groups. 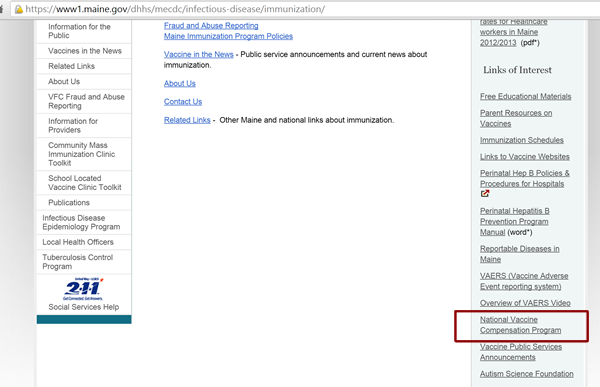 From all outward appearances, including the misreporting of our state’s vaccine uptake rates, the Maine Immunization Program seems to be intentionally trying to suppress relevant information on vaccination it order to promote an agenda of higher vaccine uptake no matter the cost to the individuals participating in the program. Parents and medical professionals need to, and have a right to, be provided with full vaccine risk information from the federal government and the manufacturers package inserts so that they may properly recognize serious vaccine injury when it is happening, and so those reactions can be addressed on an emergency basis so that life long damage does not occur. I would like to believe that this is an oversight on the part of the Maine Immunization Program, and not intentional, but there is a pattern here. My previous request for a meeting was not granted. I am formally requesting a meeting with you to discuss our concerns and how the program may do more to encourage prevention and early recognition of vaccine injuries. Ms. Taylor at this time I will be respectfully declining your request for a meeting. Will you be responding to any of the questions I have posed? Ms. Taylor – I have asked Ms. Philbrick to meet with me and her division director to discuss your questions, concerns, and assumptions. This will not occur for a few days based on my schedule. Ms. Philbrick will not be making herself available for a meeting, rather Maine CDC will be responding to your inquiries in writing once we have taken the opportunity to thoughtfully address them. Kenneth J. Albert RN, Esq. Confidentiality Notice: This e-mail message, including any attachments, is solely for the use of the intended recipient(s) and may contain confidential and privileged information. If you are not the intended recipient or an authorized agent of the intended recipient, please immediately contact the sender by reply e-mail and destroy/delete all copies of the original message. Any review, use, copying, forwarding, disclosure, or distribution of this e-mail message by other than the intended recipient or authorized agent is strictly prohibited. Thank you for your quick response. I look forward to hearing from you on these matters. Since you will be meeting to discuss these issues, I should go ahead and submit one of the questions that we wanted to discuss in person, and that we think is a central question in the vaccine injury issue in Maine. It has been the experience of our families that their physicians know next to nothing about vaccine injury, and that most of them have never even heard of the HRSA Vaccine Injury Table, which outlines the basic vaccine injuries that are compensated by VICP. The liability protection has removed the motivation for medical practices and physicians to become educated on vaccine injury, and doctors can not recognize vaccine encephalopathy, for example, often leading instead to a diagnosis of “autism” with out ever evaluating for the HHS defined vaccine adverse reaction. These children can experience brain inflammation that remains untreated for a lifetime, and this systematized medical neglect often leads to a myriad of health problems and developmental disabilities (including an autism diagnosis). This was confirmed during the hearings on LD 1076, and all of the major medical groups in Maine submitted testimony that showed they didn’t even know of the existence of the VICP, which is the US repository of vaccine adverse event information, cases and rulings. We now hold the position that if a health care provider does not know the vaccine injury table, and therefore the vaccine injuries established by HHS, then he or she is not qualified to counsel or administer vaccines. And as both the MMA, the Maine AAP, the MHA and more than a dozen other groups have admitted that they don’t know about the VICP, we can assume that no member of those organizations in Maine has been trained on the federal guidelines for vaccine injury. This is a serious problem in need of a remedy immediately. So our question is, in Maine, who is responsible for making sure that health care providers who administer vaccines are actually qualified to do so via federal guidelines and contraindications, and to then screen for established adverse reactions? Is it the Maine Immunization Program? Maine DHHS? Maine Medical Licensing Board? Further, because the health care industry and public health officials know so little about the VICP, they often make false safety and efficacy claims. We have attempted to file complaints with every state and federal agency that we thought might have jurisdiction over false claims, including Maine CDC, but no one has responded. So as there is no liability for doctors making false product safety claims in vaccination, even if a child is killed as a result, what is the remedy available to the public when they have been lied to about vaccine safety? We have other questions, but these are the structural questions we are asking first so that we can most effectively fill these gaps left by the 1986 National Childhood Vaccine Injury Act. We are eager to work quickly with Maine DHHS to solve those problems to prevent and treat vaccine injury in Maine. Ms. Taylor – Clearly this issue is polarizing for some. As you know, not all share your opinions, or those of your organization, while many others do. To answer your question very directly, the only entities responsible for complaints of negligence are licensing boards. Remedy in tort also exists if one is so inclined. Just checking in with you to see if you have had a chance yet to meet with Ms. Philbrick to discuss our concerns and questions, so we can have an expectation of when we may receive a response. Ms. Taylor – As I wrote before, the issue of vaccinations – and rights associated therewith – is a polarizing matter. The Department’s position has been well articulated in recent legislative debates. Working with federal CDC, the medical community and public health professionals, and perspectives from the public, we continually explore best practices to define our policy. As is often the case, and the nature of governments in general, not all agree with the policy. Given the many demands on our resources, I am compelled to prioritize. Thank you for sharing your perspective and your inquiries. I will take them under advisement. We are currently in the process of trying to address the wide gaps in vaccine safety education that exist in Maine (that are a direct result of the 1986 National Childhood Vaccine Injury Act). Specifically we are trying to determine whose responsibility it is to assure that doctors know and use the federal vaccine injury guidelines so that vaccine adverse events can be avoided when possible, and can be properly assessed, diagnosed, treated and compensated via the HRSA Vaccine Injury Compensation Program when they occur. As you will note from our conversation below, it was revealed during hearings in the Maine Legislature this month that not even the medical professionals running the state professional organizations were familiar with the VICP and its table of injuries. We are writing to find out what requirements are made of health care providers in Maine on vaccine safety information. Are they educated on the VICP table? What training do they receive on screening for potential vaccine reactions? Are there CME credit courses that address vaccine risks? Are there any requirements that they know contraindications listed on the package inserts? Is there a penalty for failure to screen using those contraindications if they are ignored and a Mainer is harmed? Is there a penalty for making false product safety claims to the public? If so, what is the complaint process? Physicians report that they are harassed for even asking questions on vaccine safety issues, is there a process for protecting them from retribution when they speak out on the lack of vaccine safety research and information? Does Maine have a specialist on vaccine injury? Can you forward us any and all materials that you use to inform health care providers on vaccine risk and vaccine adverse reaction assessment and treatment? To be blunt, we have a million questions. We request a meeting so that we can sort out where the information gaps are that our loved ones are falling into because they can’t get their physicians to take vaccine safety seriously. We are hoping you can begin to bridge this gap with us. *We received no response from Mr. Cooper or Mr. Smith.